To enter, you need to fill out the form by August 10th, and it will be international. Yay! Great giveaway! Also, congrats on 600 followers! yay thank you :D congrats on 600 followers!! Congrats on the big 600! Hopefully there are many more to come. Thanks for the awesome giveaway! 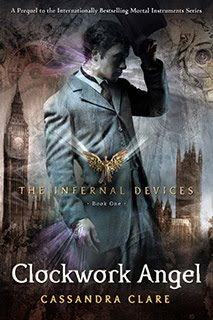 I can't wait to read Clockwork Angel!! Very cool. I threw my name in the hat. Thanks for this great opportunity! I'm an italian follower and I'm new. Perhaps we stay very far from each other, but we're connected by the powerful Ariadne's Thread of Cassandra Clare's novels! Great giveaway and I love the question! Congrats on hitting 600!! :) & thanks for offering such an awesome contest! That is one of thr 2 books I'm looking forward to the most of the year.